This is the HPI Baja 5SC 1/5 Scale RTR Short Course Truck, with an included 2.4GHz Radio System and a 26cc Gasoline Engine. 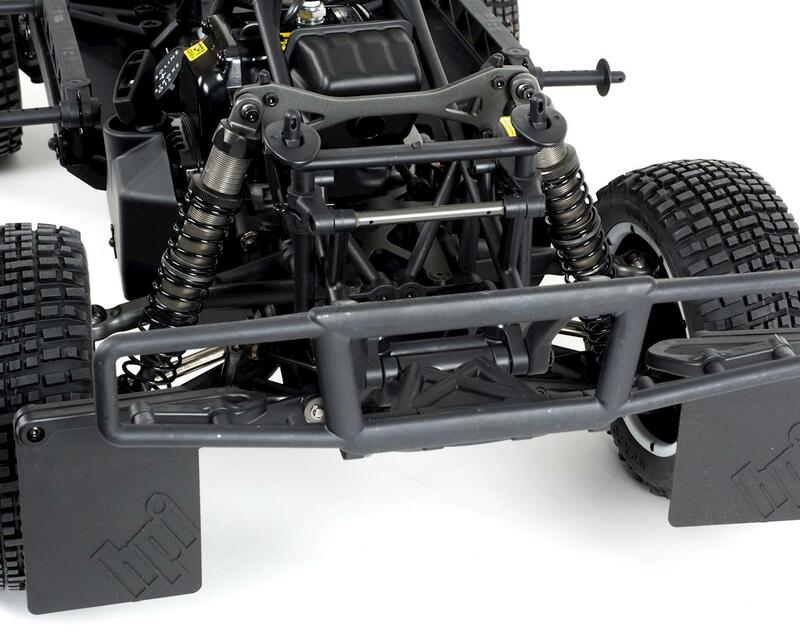 For 2013 the HPI Baja 5SC receives a Matte finish treatment for an all around tougher and more distinctive look. The visuals are further enhanced by bold graphics to freshen up the overall look of the kits. Underneath the 2013 Baja 5SC features a refined 26cc Fuel Engine driving the ultra proven Baja 5SC chassis, suspension and drivetrain. With standard features such as VVC/HD Shocks, 8000 RPM Clutch, High Flow Muffler, Viscous Torque Differentials, Monocoque Chassis, Dual Vented Disc Brakes and realistic high performance Beadlock Wheels the Baja 5SC is a high performance machine right out of the box. The HPI 2.4GHz Spread Spectrum DSSS radio system is also standard equipment on the kit along with high performance servos and a built in failsafe function to prevent low voltage runaways. 1/5 Scale Short Course Thrills! 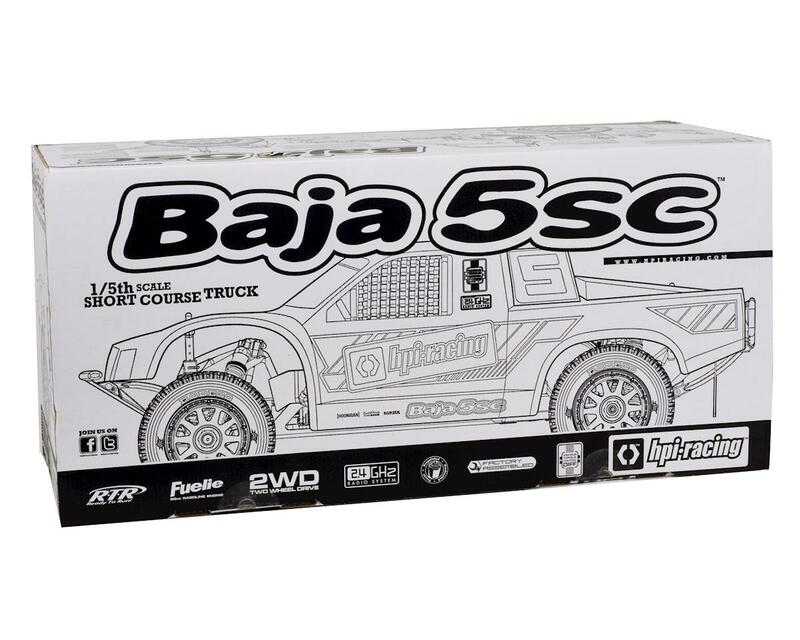 Jump into the thrill of Short Course racing with the Baja 5SC truck from HPI. The Baja 5SC takes the HPI Baja line-up on to the Short Course Track with the SC-1 body that gives the Baja 5SC authentic Short Course looks. Adding to the durability and realistic look is the skid-plate front bumper and large rear bumper with real rubber mud flaps. Power comes from a massive 26cc Fuel engine that propels the Baja 5SC to speeds in excess of 40mph and it runs for more than 45 minutes on a single tank of regular unleaded pump gasoline. For extra traction on any dirt surface, HB Rodeoo tires are now standard equipment, mounted on TR-10 bead-lock truck wheels. Durability is assured with the Super Heavy Duty 9mm drive shafts, Heavy Duty rear hub carriers, and Heavy Duty front hex hubs. A 2.4GHz radio system is standard equipment for precise control and long distance reception without the hassles of frequency crystals. It's all ready-to-run right out of the box, pre-assembled by our expert crew so you can hit the dirt quickly. Short Course racing is off-road truck racing in an enclosed dirt arena. Filled with jumps, straight sections and tight corners, short course racetracks are just like the RC version of off-road tracks...just imagine them filled with 20 full-size trucks, each with 700hp, scrambling for track position and bashing each other in the turns! You can bump and batter each other but keep the truck on its wheels, thanks to the fully enclosed wheels and tires. Short Course Body: The wide Short Course body is the first thing you'll notice about the Baja 5SC: it's more realistic and it fits completely over the wheels and tires to let you take corners deep, run the competition wide coming out of the corner and really bang together with other trucks! 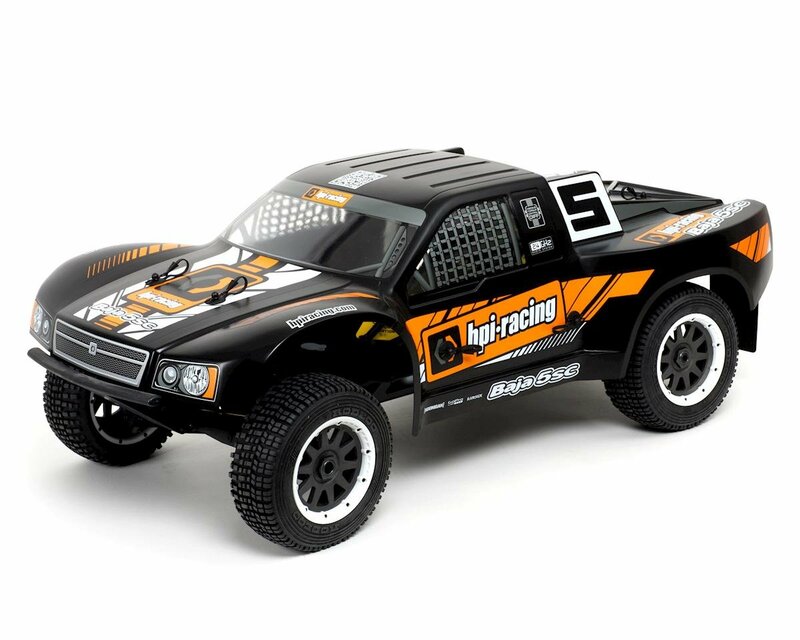 The Baja 5SC comes pre-painted in your choice of HPI Orange Brand Livery on Black and HPI Brand Livery on Silver. HB Rodeoo Short Course Tires: For high traction on a variety of dirt surfaces, HB Rodeoo tires are standard equipment on the Baja 5SC. The asymmetric tread pattern mirrors the design of full-size off-road racing tires. The sticky rubber compound, block treads and wide grooves give the right mix of sliding and gripping. Concentric rings on the sidewalls give extra grip if things get really hairy. Bold 10 spoke wheels using heavy duty beadlock rings add to the realistic Short Course looks of the Baja 5SC. Front & Rear Short Course Bumpers: The final touch in completing the scale look of the Baja 5SC is a set of bumpers that allow you to give your fellow racers a 'love tap' without risking a major incident. The bar-style front and rear bumpers look great and add that extra bit of Short Course realism! Super Heavy Duty Parts: Because of the ever-increasing power demands of Baja owners around the world, and the constant desire to cram as much power in the Baja chassis as possible, the SUPER Heavy Duty drivetrain parts comes stock to make sure the Baja 5SC can handle extreme conditions and massive power! Super Heavy Duty Drive Shafts: The extra-thick 9mm dogbones are the starting point of the 5SC drivetrain - these are thick and strong to outlast the roughest rides and racing action you can find! Wide rubber boots are included to keep the dirt and mud away. Super Heavy Duty Differential Shafts: Getting the power from the diff gears to the dogbones is a wide diff shaft that perfectly fits the large diameter of the dogbones. Super Heavy Duty Drive Axles: Getting the power to the wheels are Super HD drive axles, which fit the thick dogbones. Heavy Duty Rear Hubs: Heavy duty rear hubs are stock for ultimate durability and easy adjustment of the toe-in setting. The hubs are light weight and allow toe-in adjustments of 0, 1, 2, 3, and 4 degrees to help match the truck performance to track conditions. 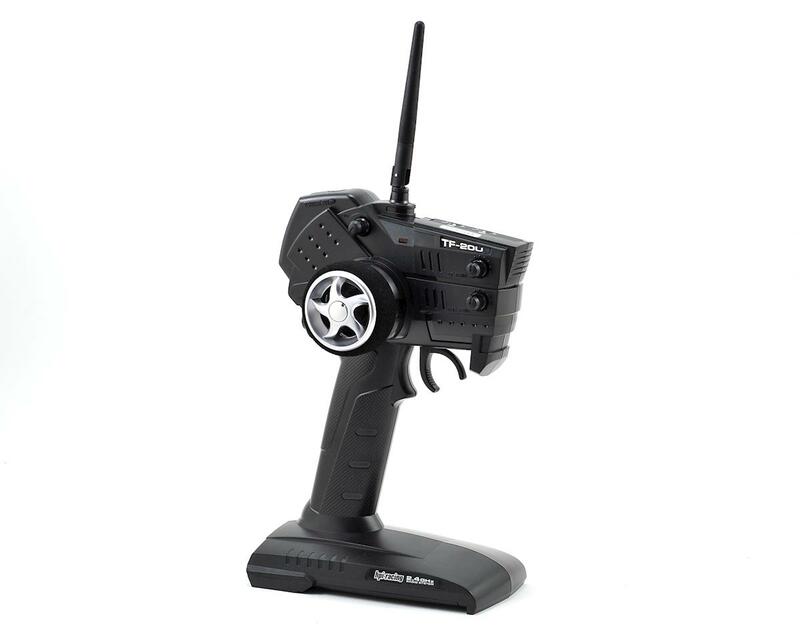 High Quality Radio Equipment: The steering servo is a massive metal geared unit for quick steering, and lots of torque. Standard equipment includes a high capacity NiMH rechargeable receiver pack and an AC charger. A powerful large-scale SFL-11MG steers the front wheels with ease. Sealed Radio Box: The radio system is protected by a sealed housing with an external charging jack, and both servos are water resistant designs that allow the Baja 5T to be driven in extreme off-road conditions. Heavy Duty Shock Absorbers: VVC/HD shocks deliver improved handling over rough terrain and feature large 6mm diameter shock shafts for increased durability. Threaded shock bodies are used for easy adjustment of ride height. Long Travel Suspension: The awesome Baja suspension really comes into its own with long-stroke VVC/HD shock absorbers and high-sidewall truck tires, letting the tires do their business whether you're driving over rutted-out whoops or flying over a big tabletop! Fuelie 26cc Engine: The powerful refined Fuelie 26cc gasoline engine propels the Baja 5SC to speeds in excess of 40mph. With a dual-element air filter, easy pull starting and convenient Torx T-27 screws, it's easy to keep running on standard pump fuel and 2-cycle engine oil. And best of all, you can run for more than 45 minutes on a single tank of gas! 8,000 RPM Clutch: Standard on the Baja 5SC, this lightweight racing clutch combined with the heavy duty spring gives the 5SC a powerful launch at high RPMs for faster acceleration! Metal Transmission Gears: From the input shaft and idler gear to the alloy-encased differential, every gear inside the sturdy Baja 5SC transmission is made from long-life alloy to keep your truck running all day long with minimal maintenance. Viscous Torque Differential: Unique in the world of large-scale racing, the HPI Viscous Torque Differential gets the power to the rear wheels as smooth as silk. It's easy to tune with optional diff oils and is fully fitted with hardened metal gears and an alloy case. Dual Vented Disc Brakes: Steel/aluminum hybrid brake rotors and semi-metallic brake pads handle braking duties, while a special venting system keeps the brakes cool for consistent stopping power. 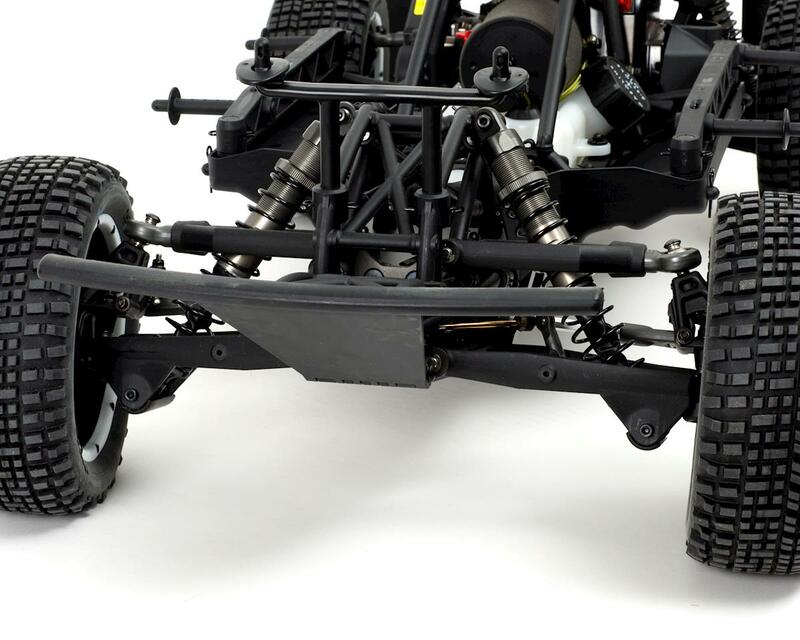 Dirt Guards: The Baja 5SC has full-length dirt guards to keep mud, rocks and water out of the main chassis area. The guards continue all the way to the engine and help keep cleaning time to a minimum. And, mud flaps on the rear bumper add to the realistic Short Course appearance. 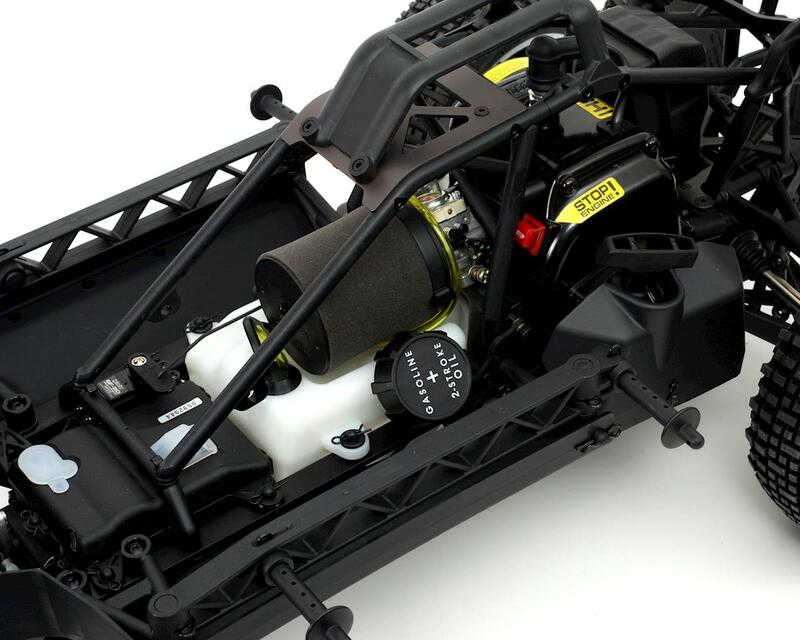 Large 700cc Fuel Tank: For runtimes of up to 45 minutes, the Baja 5SC fuel tank holds up to 700cc of pre-mixed fuel - that's over half a liter! And just in case you clip a track barrier and flip over, the tank is equipped with a 'clunk' device that allows the engine to continue running even if the truck is resting on its roof. 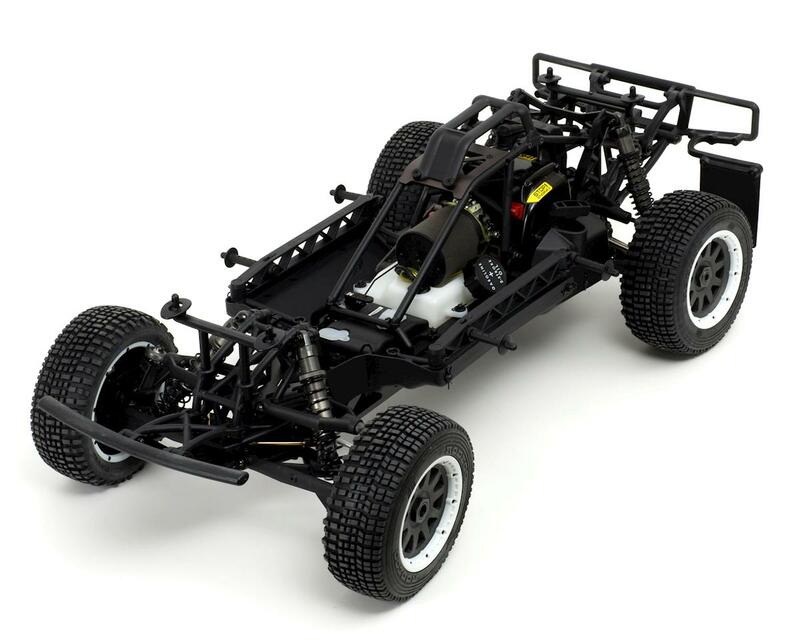 RTR - Performance Straight From the Box: HPI makes it super-easy to get into large scale! The Baja 5SC is completely pre-built, painted and assembled right out of the box, so hitting the dirt is fast and easy! All you have to do is open the box, add AA batteries to the transmitter, charge the receiver battery (charge not included), add 25:1 pre-mixed fuel and go! Full Assembly Instructions and HPI RC Cars DVD: As with all HPI cars and trucks, you get a full, in-depth instruction manual with step by step instructions that allow you to easily disassemble and reassemble your truck for maintenance and easy servicing. The HPI RC Car DVD is your personal RC car expert in a box!